Just a quick message to thank you for doing a brilliant job at Emily and Ben’s wedding! I hope it didn’t take too long to unpack everything, and you got home safely! It was really nice to meet you and I hope we have the chance to work together again! It has been two weeks today but we would love to thank you so so much. You were one amazing DJ who really made our party! Everyone was dancing the night away. Is there a page that I can write you a very positive review on? Because I would really like to do that. Furthermore I was wondering, the playlist you had on during dinner, can I maybe find it somewhere? Just wanted to say a huge thank you for your services at our wedding! You were fantastic. Thank you so much for the music you played, it was exactly what we wanted. I will post amazing reviews, where should I do that? We just wanted to say thank you for your amazing DJ skills at our Wedding last weekend. Our guests really enjoyed and you played some fab tunes! I’m sorry for writing to you so late, but Paul and I wanted to say a huge thank you for such an excellent wedding two weeks ago. Your mix of music was absolutely excellent and all our guests mentioned that dj service and dancing was the highlight of the evening! I have passed your details onto the caterers who also thought that you were excellent, so hopefully you will have some recommendations come through. I will send across some professional photos once we have these finalised for your use on the website. Once again, thank you for making our wedding so successful. Thank you so much for your amazing DJ-ing! Everyone absolutely loved your music. The lighting, speakers and the smog machine were just fantastic! Thank You! Thank you so much for last weekend. The music you played at our wedding was nothing but perfect. We were exhausted the day after from all dancing and pretty much all of our guests, including a couple of djs, praised the music and the light show. I wanted to thank you for the amazing and excellent job you did yesterday with the music. Everything you and all the songs you played and how you played them was awesome just how we wanted it. We had the best time and the lights and the smoke machine just made the experience even more incredible. We would like to say a MASSIVE thank you to you for playing one of the best parts of our very special, dream wedding day. You were great to work with, you played some fabulous music and it was a pleasure to work with you. Everything was truly amazing that day and everyone enjoyed themselves, loved the evening entertainment and danced from the very beginning all through to the very end. Thank you sooooo much for all your hard work, we will highly recommend you to anyone who wishes to get married in Italy and requires a reliable DJ. Hi Daniele – thank you for the great DJing at our wedding! All the guests said you were excellent. Thank you so much for an amazing party at our wedding – all our friend were saying how amazing the music and lighting were – the sound set up was absolutely perfect! I think I owe you some additional money – please let me know how much and I will arrange payment immediately. Thanks again – it was really fantastic to have such a great DJ at our wedding! Just a quick note to thank you very much for your service last week. We had a great night,everybody really enjoyed the night, the music was great and we a great night dancing. 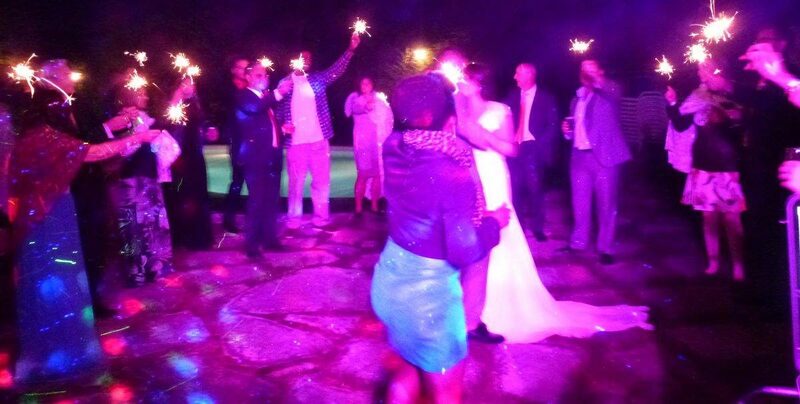 Molly and I wanted to thank you for being a part of our wedding celebration on Tuesday May 20th at Villa Vignamaggio. We thought you did a fantastic job DJing the dance. All of our guests had a really great time, the setup was fun, and you were an excellent DJ. Thank you again for being a part of our celebration. We also really appreciate you bringing the guitar to us on Monday so that we had it a day early. Thanks a lot for your service again! Many guests said it was not just their best wedding, it was even one of their best parties. So, all in all, it was a big success, also thanks to your service! Thank you for the fantastic job you did at Melissa and Jesus’ wedding at Spaltenna! Many guests commented on how great the music was! The lighting was also fantastic! I really enjoyed working with you and look forward to working with you again next time I’m in Tuscany! We are writing to you to thank you for the amazing D.J. service you provided at our wedding on the 19th May 2012 in Riotorto, Tuscany. Riccardo and I, and all of our guests had a truely fantastic evening, and everyone loved the music you played ! Infact many of our guests said it was the best wedding they had ever been to! You played all of our favourite songs, and also a few tracks from the 60’s and 70’s to suit the older generation. Infact the dancefloor was consistently full of people having a great time ! Your music, and incredible lighting effects created a wonderful party atmosphere, and provided the perfect finish to what was the best day of our lives. We can’t thank you enough! You have been very professional at every stage, responded promply to our emails, and answered all of our questions. We have no hesitation in recommending your services. Thank you so much Daniele “Pink Panther” you have made our wedding day absolutely perfect ! We wish you every success for the future. Please find attached photos of our wedding, …..
Just wanted to thank you for all your hard work at our wedding. We had a wonderful time, as did all our guests, and we would be very happy to recommend your services in the future. We just wanted to send you a big THANK YOU!! The party was amazing and we had a lot of fun!! We hope you had a safe journey home. Thanks again for everything!! We will defenitely recommend you. Just a word to THANK YOU, our wedding was fantastic and you played a major role in it, for the ceremony, cocktail, and party that all guests loved. If i can be of help for you in recommending your service (facebook, website, pictures i can share with you?) Let me know. We want to thank you for being our DJ. We really had a great party thanks to your music and great lights. It was also perfect that you stayed till late in the morning…..Everybody enjoyed your music.